You’re lying there all bundled up in your warm blankets when all of a sudden your eyes flash open, and bam, it hits you: you are late. Late for class, late for work, late for everything else that pops up on a whim and you need to get ready quickly. I am one person that takes literally forever when doing my makeup. All of my friends know to give me a heads up if they want to go out because I need at least two hours to shower, let my hair air dry a bit, apply my makeup, and get dressed. Getting all dolled up is one thing I really love so I like to take my time. But, on those days where I need to be out the door as fast as possible, I go for these products because it is quick, no fuss, and natural. 1. CK One Mascara in True Black: I like this mascara for my bottom lashes. It really separates, thickens, and intensifies them. 2. The Real Techniques Buffing brush (comes in a set) is one of my all time favorites. It blends and buffs makeup into the skin beautifully and I use this with my powder foundations to set my foundation. This brush is also very affordable, soft, and it never sheds. 3. Too Faced’s Chocolate Soleil is a great matte bronzer. Many people rave about how delicious it smells since it smells like chocolate, and it does smell good on the first whiff. However, the more you smell it the more artificial-like it smells, and now it just smells like playdough to me. I don’t like the scent, but the color payoff is worth the thirty dollars! 4. A tinted moisturizer is great for a woman, or man, on the go. This MAC Studio Moisture Tint has an SPF of 15 and really good coverage. If you are someone that does not like sheer coverage anything because you really need to fix those blemishes, this is the product for you. It blends in very smoothly and it is not too matte or too dewy; it just looks like your natural skin. If I am in a hurry I blend it in with my fingers, but if I have extra time I blend it in with a brush. 5. MAC’s blush in Breath of Plum is a gorgeous warm plum color that is great for the Fall/Winter season. Blush is one thing in this list that I change depending on my mood or the season. For this particular day, I chose Breath of Plum because it is just enough color and it looks pretty natural. 6. MAC’s Haute and Naughty Lash is my go-to mascara and I have repurchased it about 6 or 7 times. This is definitely one product that is a staple in my makeup collection, and it will remain a staple forever and ever! It has two “compartments.” If you unscrew the purple cap the mascara wand has a lot of product on it, which will create a dramatic effect when applied to your lashes. When you unscrew the top hot pink part the mascara wand is the same, but most of the product is gone so it creates a much more natural, fluttery effect, which is my favorite. It’s hard to explain how great this mascara is, but it is basically like having two mascara wands in one tube. 7. Another staple that is always in my makeup collection is MAC’s Studio Fix Powder in NC40. This is a great foundation powder that has wonderful coverage as well as a matte finish, which is my favorite. Also, it is so smooth and finely milled that it buffs into the skin really well– I use the Real Techniques Buffing Brush [#2 in this list] for a flawless finish. 8. The Real Techniques Blush Brush is a great versatile tool that I use on a daily basis. The bristles are extremely soft and they do not shed. Also, it is very affordable! Sometimes I use it with my blush and sometimes I use it to apply my bronzer. 9. NARS Albatross is a great gold highlight that leaves your skin looking very natural and radiant. I love it because it is not overpowering like some highlighters can be. The pigmentation is spot on and looks especially amazing on medium/ tan skin. I apply this on the tops of my cheeks, chin, nose, and cupids bow. 10. Last is the Real Techniques Expert Face Brush. I use this to blend in my foundation and just like every other Real Techniques brush it blends everything into the skin beautifully without making your makeup look cakey or appear to just be sitting on the surface; it really works the foundation into your skin wonderfully. 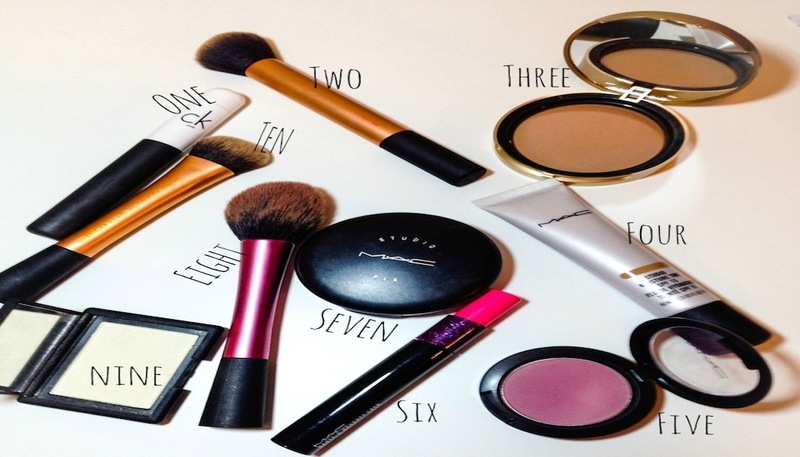 I hope you check out some of these products and love them as much as I do! What are some of your go-to products that you reach for when you are in a hurry? Let me know in the comments below!